There are 23 universities in the California State University (CSU) system, and at first glance, they all seem to be pretty much alike. Not so when you dig deeper! 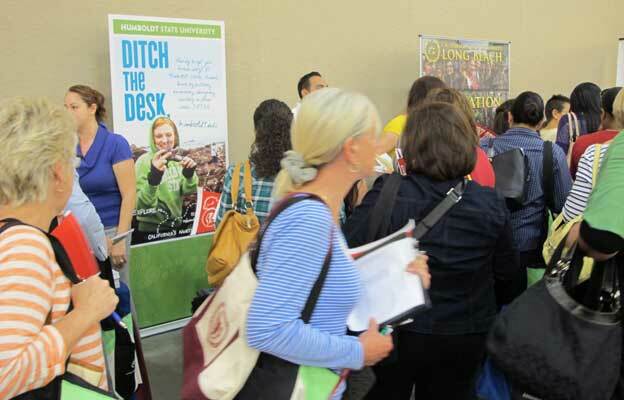 Navigatio attended the CSU Counselor Conference this week gleaning unique details & characteristics of each campus. Upon closer inspection, the differences far outweigh the similarities! CSU San Bernardino is internationally known for their Business & Cyber Security program while CSU Stanislaus houses a vigorous Criminal Justice Department, and strong academic support. STEM Education (Science, Technology, Engineering and Mathematics) dominates the Cal Poly San Luis Obispo campus with 1/3 of all students enrolling in these majors, while boasting a lively college town atmosphere. Fresno State University and the surrounding community go ballistic during football season, and by the way, the Bulldogs of Fresno just beat Boise State! Want to attend a waterfront campus and get training for careers in shipping, engineering or international studies? Take a look at CSU Maritime! At Humboldt State University you can “ditch the desk” and study amid 600 acres of redwood forest or aboard a marine laboratory preparing students for careers in fisheries biology or environmental sciences. Every single campus houses unique programs and opportunities, so do your homework on the CSU’s and set yourself up for success!